Export revenues grew by 7% to a new high of £2.6bn, UK Music’s Measuring Music report said. The biggest selling album of the year was Sheeran’s ÷ (Divide), with singles including Shape of You and Perfect. UK record sales also saw a surge, netting £700m over the year – up 9% on 2016. 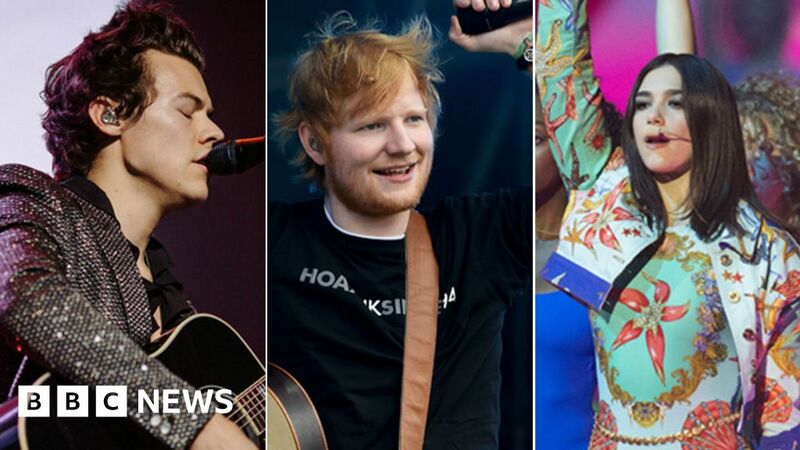 For the second year in a row the number of successful records by British artists bucked the trend for annually declining music sales – which had slumped to £610m in 2015. Sheeran accompanied fellow Brits Rag’n’Bone Man, Sam Smith and Styles in the International Federation of the Phonographic Industry’s (IFPI) global top 10 for 2017. Dua Lipa added to the success after becoming Spotify’s most-streamed female artist of 2017 – beating the likes of Beyonce and Taylor Swift. Festivals and live events including world tours by Coldplay, The Rolling Stones and Sir Paul McCartney also accounted for £1bn of revenue – with the report confirming the O2 in London was the world’s most popular arena. Last year saw five of the top 10 most successful worldwide tours come from the UK – with Depeche Mode and Sheeran alongside the aforementioned acts. Overall, the UK music industry contributed a record £4.5bn to the UK economy last year – up £100m on 2016. But UK Music’s chief executive Michael Dugher issued a warning about the need to nurture the music industry’s talent pipeline and to give people from a variety of backgrounds access to a career in the industry.